#1 I am so glad it's the weekend! I want to start a new Korean drama this weekend. I was thinking of starting Goblin because it was one of the best dramas that came out last year (In my opinion Weightlighting Kim Bok Joo was the best drama of 2016!). Have any of you seen Goblin? #2 Thank goodness for DAY6. They are my current favorite band. They are a K-pop group band that plays soft rock/alternative music. I've been a fan of them since their first single, Congratulations. This year they are releasing a new single every month and they're the best! Before I discovered K-pop I was into rock and alternative music, that's probably why I adore their music so much! My current favorite song by them is How Can I Say. #3 I finally bought keychains this week. I want to sell cute bag charms and keychains in my shop. I have a couple ideas but I haven't tried crocheting any of them yet so wish me luck! I will update you guys if they come out well. #5 This week my goal was to workout 4-5 times a week and rest on the weekend. I decided to start the Blogilates because I like how you can access all the videos all in one place. I have a love and hate relationship with Blogilates but it's what I've decided to use to stay active, for now. I forgot how sore you get when you start working out. Arm day was Tuesday and I'm still feeling sore and it's Friday! #6 I've mentioned Sprinkled Pug before. 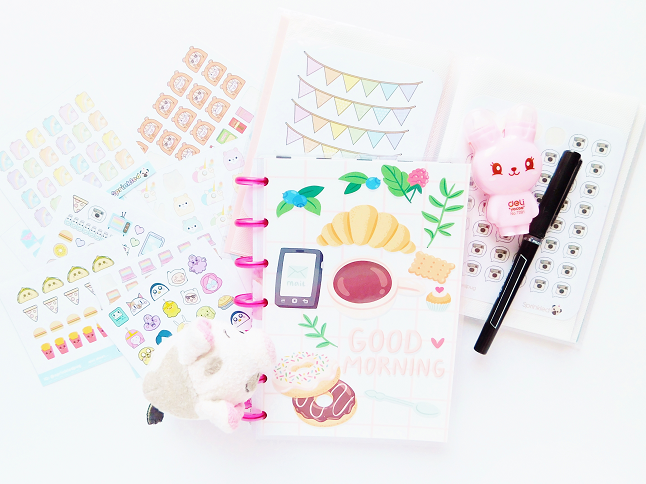 It's a sticker shop that offers a variety of kawaii stickers. Well if you follow her Instagram you know that every once in a while she sells $1 mini stickers sheets. I have been buying a couple of these sheets to use in my mini Happy Planner because they are the perfect size for it! I still use the regular sizes but prefer to use the mini stickers in my planner because they take up less space. #7 I am currently in a blogging rut. I can't think of any worthy blog post ideas or pictures that look decent. If you blog often then you know that these come and go from time to time. The other day I took multiple blog pictures but when I was editing them they all looked terrible. Hopefully, this weekend I can snap some better photos.